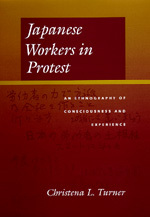 This first ethnographic study of factory workers engaged in radical labor protest gives a voice to a segment of the Japanese population that has been previously marginalized. These blue-collar workers, involved in prolonged labor disputes, tell their own story as they struggle to make sense of their lives and their culture during a time of conflict and instability. What emerges is a sensitive portrait of how workers grapple with a slowed economy and the contradictions of Japanese industry in the late postwar era. The ways that they think and feel about accommodation, resistance, and protest raise essential questions about the transformation of labor practices and limits of worker cooperation and compliance. Christena L. Turner, an anthropologist, is Associate Professor of Sociology and Adjunct Associate Professor at the Graduate School of International Relations and Pacific Studies at the University of California, San Diego.